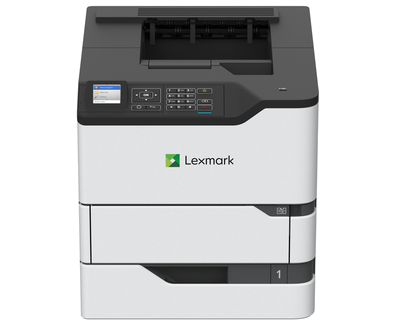 The Lexmark MS821dn features a first page in just 4.5 seconds, output of up to 55  pages per minute* and two-sided printing. A combination of 1-GHz dual-core processor and 512 MB of memory (upgradeable to 4.5 GB) has the power to handle demanding tasks right now while providing a secure, upgradeable framework for future advances in product functionality. And all two-sided-printing models in Lexmark’s most energy-efficient line of large-workgroup monochrome products ever are rated EPEAT® Silver and ENERGY STAR® (2.0) certified. With new front power button and USB port, 2.4-inch colour LCD/keypad to monitor and configure system settings and single-door access to parts and supplies, it’s easier than ever to get things done. Convenient front access to the paper path means you’ll virtually never have to access the back of the device, allowing placement in or on cabinets. And ADA-compliant trays have push-button sliders and open with one hand, requiring low force and no twisting. A first page as fast as 4.5 seconds sets the stage for printing and copying up to 55  ppm*. And support for large workloads is built in, with recommended monthly page volume as high as 350,000 pages.